Awhile back, the thirteenth book in the Elvis Cole and Joe Pike novels by Robert Crais inspired a series at my old blog. It examined each novel (up to that point in time) and the audiobook versions that came out of them. I composed a more complete review of that novel, The First Rule, and followed it with another for the next Joe Pike novel, The Sentry, on this blog last year. Since the author continues to write more of these things, I’ll just have to continue my perusal of the U.S. and U.K. versions of his work. 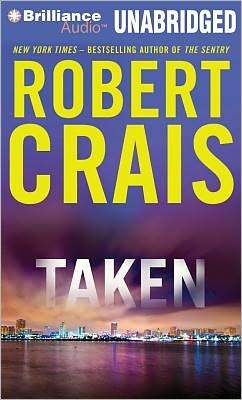 Years ago, television writer/producer Robert Crais turned away from Hollywood and began his migration to novelist. He originated a quirky but distinctive private detective with the unlikely name of Elvis Cole, and his memorable laconic partner, Joe Pike. That first book’s success, The Monkey’s Raincoat, brought the PI genre something extraordinary byway of the author’s writing style and remarkable characterizations. The humor that epitomizes Robert Crais’ work, along with the rich relationships and poignancy of his stories, brought the soon-to-be-popular books to the fore of the mystery crime class. While the series is well into its third decade with publishers and admirers, Elvis and Joe still continue to earn new fans with each new book release. 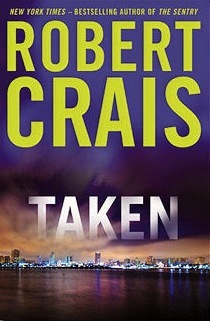 TAKEN‘s hardcover book was print published by Putnam Adult for their usual (for this author) January release in the U.S. market for 2012, pictured above left. The U.K. version was published a little later than in the past, toward the tail end of April. Its cover (the lower image) is again in sharp contrast with that on the other side of the pond. The Orion Publishing Group, given their recent graphical treatment in cover art, has trended toward the dramatic in the Crais’ series. Even Putnam’s went away from their traditional sunbaked L.A. scene with their U.S. hardback with the clean evening shoreline imagery for the City of the Angels. The U.K. edition and its lone figure as the focal point is getting a little staid. I mean, how many times, and outfits, can they run through? They’ve done better in the past. The U.S. cover works better graphically, again. But Nita is wrong. The girl and her boyfriend have been taken by bajadores – bandits who prey on other bandits, border professionals who prey not only on innocent victims, but on each other. They steal drugs, guns, and people – buying and selling victims like commodities, and killing the ones they can’t get a price for. Elvis Cole and Joe Pike find the spot where they were taken. There are tire tracks, bullet casings, and bloodstains. They know things look as bad as possible. But they are wrong, too. It is about to get worse. Going undercover to find the two young people and buy them back, Cole himself is taken, and now it is up to Joe Pike to retrace Cole’s steps, burning through the hard and murderous world of human traffickers to find his friend. No one, in their right mind, has accused Robert Crais of repeating himself, or using a formula. Oh sure, fans of this series know Elvis Cole will crack wise or that the corner of his partner Joe Pike’s mouth will silently, briefly twitch. And only now and then, which is the extent of his emotional display. Plus, having this duo save someone’s day, or life, is a given. Nope, you can’t have an Elvis and Joe novel without these components. A novel series without a set of rudiments of characters and situations to adhere to just won’t be long-running, as this one clearly does. It’s the nature of popular storytelling and what readers have come to expect, and more importantly enjoy. Here’s the thing, though, with this author. We, his readers, know he’ll deliver on all of these essential elements, once more, with each new book release. And he’ll somehow make it both familiar and fresh. How does he accomplish the latter? If I could somehow pinpoint that one, I’d patent and license it, and not have to work for a living. With TAKEN, he’s clearly done it again. While I could mention the thriller’s time element that courses through the novel, rings of The Last Detective, I won’t. I guess I could keep to myself the detective work in piecing together the mystery of what happened to Elvis’ client’s daughter was so deductively skillful to remind me of Chasing Darkness. And let’s not forget that the non-linear, time-jumping storyline is a throwback to L.A. Requiem. It is, and more significantly, it’s also not. What the author has artfully and imaginatively assembled in this instance is one more novel that delivered anew his trademark dialogue and action, but with enough mystery and suspense so that we wondered for and cared about the outcome. Especially, the smart-alecky partner who also ends up taken. As is my habit, this is my second go around with the novel in the same year. Once more, the book comes off better on the return trip — not that the first was bad. Uh huh. It’s just Robert Crais’ writing appears effortless, at first glance. To some, that means simple. No, in this case it means more, and something harder to attain. The word they should be using is elegant. Certainly, another aspect Crais reuses of late is how he anchors to a particular location as he tells his story. In this case, the low desert community of the Coachella Valley (he successfully incorporated Venice for The Sentry and Westwood Village in The First Rule). To those of us who live in the southland, it’s a treat how he pivots off of these regions for his characters. Certainly enough to give the other personality, one (except for two books) who is always there, and a unique influence in his tales. In point of fact, these localities are but a new mask she wears as she embarks on yet another neo-seduction of the reader: the city of Los Angeles. Few writers can approach that same level with this city as Robert Crais regularly accomplishes in his writing. No, the fundamental core is family. Not the one you’re born to, but the one you chose. Especially between a pair of men whose lives have been affected by troubled childhoods. Like this town, they’ve re-invented themselves. So, when Cole is abducted by vicious kidnappers in the course of the story, Pike reacts as any kin worth their salt would to recover a loved one. With anything in their power, marching through Hell itself and killing whatever, whoever gets in the way of that goal. As my good friend Jen Forbus said in her review, it “… is an emotionally charged novel” that this author, as he normally does, delivers upon. A sample of the work is available on Brilliance Audio’s TAKEN web page. AudioGO, one of the most prolific publishers globally, and formerly known as BBC Audiobooks, has made some conspicuous moves of late. In the past, their artwork would mimic (but not necessarily copy) Orion’s hardback. In this case, that meant putting another even more chiseled figure in a yet tighter muscle tee-shirt on the cover. Sheesh! At least on the plus side, AudioGo released the audiobook to MP3 download the same day overseas as Orion’s book edition (the CD version followed some weeks later). This hasn’t been the case in the past. Of course, region restrictions prevent some download purchases (ahem, like in the United States). As has been their long-time tradition, the AudioGo audiobook (they only offer unabridged recordings, btw) employed their redoubtable series veteran, narrator William Roberts, for their almost 9-hour (8:54) audiobook. 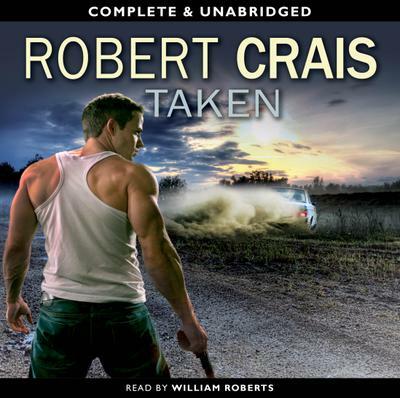 Roberts remains the only professional narrator who has read all of Robert Crais’s novels in this series, save for one (L.A. Requiem). And he’s comfort food for those of us lucky enough to have listened to his readings. Though classically trained to the stage, an American who lives in Britain, his style is quite different from that of Luke Daniels. It’s not a bad thing, just different. He also understands inflection and the power of the well placed pause in his narration. If you’re fortunate to catch his Elvis and Joe — incidentally, his reading of Jon Stone’s morning serenade as he greets the city of L.A. is something and well worth hearing — you may find yourself hooked. A sample of this version of TAKEN by AudioGo is available on their associated web page. 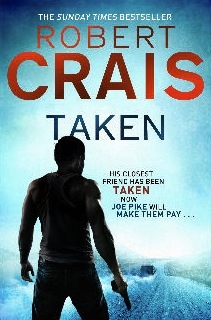 These days, you can’t go wrong picking up a Robert Crais novel. Here and abroad, the same can be said for the offerings in audiobook, no matter who is narrating. Coming up next: ? — Robert Crais mentioned last Spring that his next novel will be a new standalone before he returns to Elvis & Joe. I love your “spin-off” series of these books and really enjoy the audiobook twist. Since I’m one of your audiobook converts (and still struggle with my critical analysis of said) I really enjoy the thoughtful commentary you include re audiobooks. Ditto on those awful UK covers. This from-the-back pose of ‘roid muscled white men is starting to feel like an offering from the stock catalog. Yech! It’s funny you should do a Robert Crais post when I was just yesterday thinking the Craisies should do another book discussion and this time on TAKEN. Thoughts? And I’d agree that this would be a great one for another online ‘Craisie’ discussion. It has a number of memorable moments that lend itself well to another such stint. I’m in, and hope others would like to participate. Glad to hear you like this spin-off, Rachel. Thanks for reading and leaving a comment. Ooh, that is a great to start your audio journey, Novroz. Perhaps, you’ll write up your experience with the form? Thanks for reading, my friend. Hi, sorry this is slightly off-topic, but has anyone noticed that AudioGo UK is bankrupt? What the heck is going to happen to the William Roberts readings now??? Welcome, brwims, and thanks for bringing this tidbit to my attention. They buy the BBC content and then run the business into the ground?!? What a supreme waste. I hope someone will keep this material, especially William Roberts’ work, available for audiobook listeners.